A foyer is more than just a place to hang your hat or rest your umbrella. In many homes, the foyer is the first thing guests see when they enter. You might say that the foyer represents your home's first chance to make a great impression. Decorating a foyer to match the personality of your home requires a little research and plenty of thoughtful decision-making. 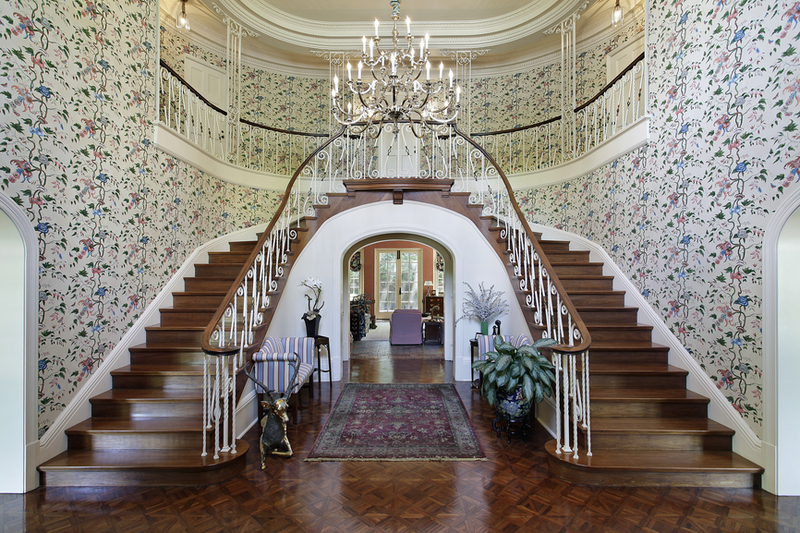 Whether you're looking to create something casual, regal, welcoming, or its own little world, foyer wallpaper can help. n the average home, the foyer is a smallish area just inside the front door. It connects to the living room or family room, and possibly a main stairwell. The foyer may already have a hat rack, umbrella stand, shoetree, or something else that gives it a little personality of its own. Adding a fun pattern or fresh color can add a whole new dimension, creating a vibe that follows guests through the rest of the house. Foyers in movie theatres or opera houses are often adorned with art, draperies, or other fancy accoutrements. It's possible to create this on a smaller scale right in your home – if opulence is what you're looking for. Additionally, something as simple as a border with a fun theme can make a foyer come alive with color. Foyer wallpaper can be as varied as your imagination. It can tie multiple rooms together, which gives you numerous decorating options. Foyer wallpaper and borders can lead into hallways, up staircases, or right into the next room. Consider things like temperature, humidity, and how the room will be used. In some homes, the foyer area is closed off with a second door that keeps outside air from letting out heat, or letting cold air in. If your foyer experiences high variations in temperature or humidity, you'll want to avoid fabric wall coverings like velour or velvet, raw silks, or string cloth. Instead, choose more durable foyer wallpapers like latex or vinyl, or even paintable wall coverings that can be freshened up or re-colored occasionally. Paintable wall coverings are available in an array of raised patterns that add subtle texture and an influx of style whether used on one wall, or a whole room. Foyers that will be holding wet shoes, jackets, or umbrellas are best served with washable wall coverings that resist moisture and will stay put even in changing weather. In Wallpaper Installation we have everything you need to upholster your walls, stairs and much more do not hesitate, ask for our offers.